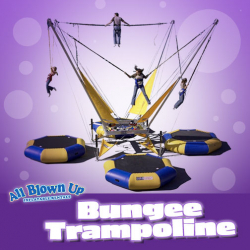 The area’s only mobile bungee trampoline, this is an EXTREME attraction like no other! It’s available for private parties, corporate events, festivals, carnivals, school events, post-prom events or any event where you want to have EXTREME fun! We offer 1, 2, 3 or 4 bungee stations, and we only have a 4-hour rental minimum to make this an affordable extreme attraction. The Bungee Trampoline comes complete with trained operators so you can jump in and join the fun!